However, the 74C00 and 74C02 are considered obsolete and no longer available, so I attempted to replace them with 4000-series ICs. The 74C00 is a quad-NAND (AND gate with an inverter on the output) IC, which was replaced with a 4001, and the 74C02, a quad-NOR (OR gate with an inverter on the output), was replaced with a 4011. I did not use the PCB featured in the article because the pinouts of the new (4000-series) ICs were slightly different from the original ICs and for other reasons. Although the circuit may seem quite complicated to start from scratch, I idenified each section and built a section at a time. I hand-wired the connections, checking rigorously as I went on, and was fortunate to only have one minor short that was fixed easily. However, there were a few modifications I made to the schematic, aside from the pinouts, to fix some problems I've had with the circuit. For instance, the horizontal circuit for the ball had some problems because (in my case) the ball slides to the left paddle and stays there or bounces irregularly as if the paddle were attracting the ball back whenever it tried to escape. After two days of hard troubleshooting, it was quite obvious the flip-flop (IC 5) that operates the ball's horizontal position would not trigger properly - due to a strange imbalance between the two inputs. I never could solve the problem replacing the .0047uF capacitors, changing the 10Meg resistors, nor the IC itself! However, I put a 10Meg resistor across each inverter (basically a quad-NAND with both inputs tied - 3C and 3D in the schematic) from the input to output and that seemed to crudely clear up the problem. 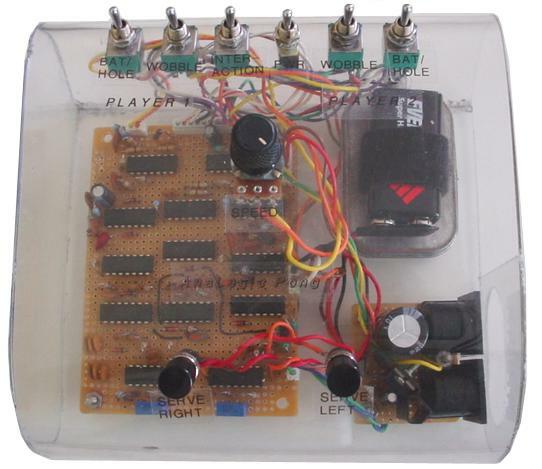 However, sometimes the ball would still stick, so the game had to be shut down for the capacitors to discharge, so they could hopefully be charged up equally when the game is turned back on. If there was some sort of imbalance on the flip-flop, the ball won't move properly horizontally or stick on one side. I've also learned that putting a capacitor smaller than .0047uF resulted in the ball sliding through the paddles, and a resistor smaller than 10Meg would not trigger the flip-flops properly. 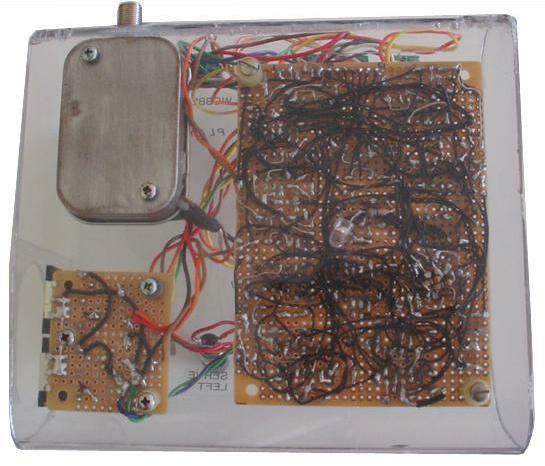 Below is a section of the schematic with the only necessary modifications (highlighted yellow), which are the 10M resistors across the inverters. Other than the horizontal issues, I had nearly no other problems with the rest of the circuits - except for the slightly shifted center line that did not bother me too much. Other modifications I did that were not necessary were putting a 10K pot for the controllers instead of a 22K - the only difference is a small increase in current draw from the battery and supplied current to the circuits. Keep in mind that this is an analog system, capacitor and resistor values are critical. The PONG game provides composite video (although it doesn't seem synchronized without the RF modulator, and I found that the hard way), which feeds into a RF modulator to a TV. I salvaged a good quality RF modulator from a VCR, and operates on channel 3 on the TV. 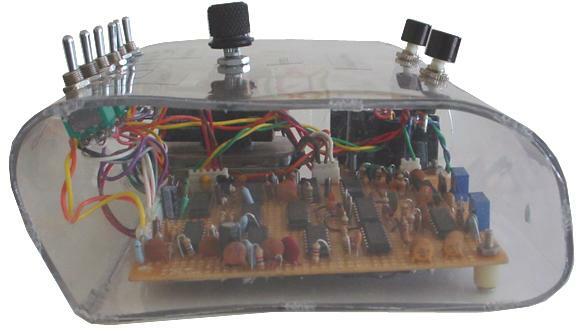 The RF modulator featured in the schematic works, but is not as good in quality. BL Bat Left Generates pulses that positions the left paddle aka. bat. BR Bat Right Generates pulses that positions the right paddle aka. bat. CL Center Line Generates pulses that positions the dotted center line. LS Line Sync Generates the horizontal pulses, which I believe is the "base" frequency (15,750Hz for the U.S.). FS Frame Sync Generates the vertical pulses, which I believe is the "base" frequency (60Hz for the U.S.). LL Lower (Bottom) Line Generates pulses that positions the bottom line. NH Net Height Generates pulses that positions the dotted center line between the upper and lower lines. 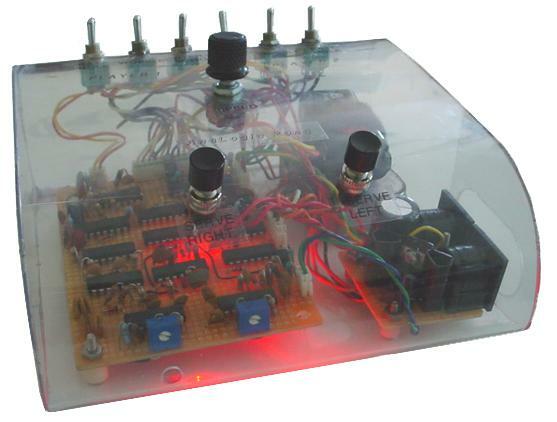 A Generates vertical signals to move the left paddle up or down. B Generates vertical signals to move the right paddle up or down. C Generates vertical signals to move the ball up or down. D Generates horizontal signals to move the ball right or left. E Signal to put the upper line (UL) and the lower line (LL) into the video. F Signal that drives TR1 for some vertical movement of the ball by player 1. G Signal for horizontal movement of the ball and for serving the ball in one direction. H Signal for horizontal movement of the ball and for serving the ball in the opposite direction of above. J Signal that drives TR2 for some vertical movement of the ball by player 2. V+ 6V+ source This should be self-explainatory. I used two 5-pin DIP ports for the input from the controllers since I had several useless DIP cables. 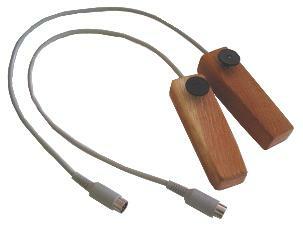 The controllers were basically built using a pot sandwiched between two pieces of wood, which was sanded down then stained/varnished. NOTE: The serve switches are on the console, not the controllers so returning the ball to the playfield is easier for a single player. Also the 4000-series ICs used less power and seemed to perform badly at 9V, but perfectly from 5 to 8 volts, so I put in a 7806 6-volt regulator to regulate the battery's output to 6V. 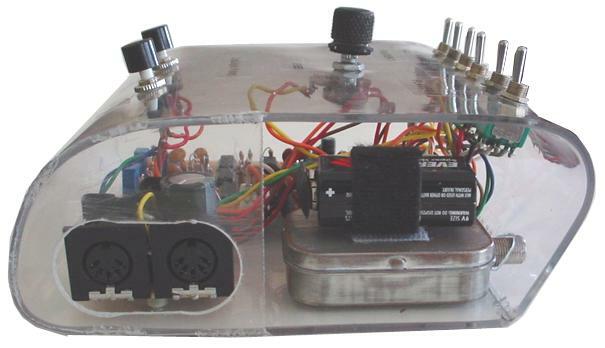 The case was built out of plexiglass, and it was not easy at first. I cut the plexiglass to the desired size, and drilled holes for the switches before I attempted to bend the plexiglass. First I tried a hair dryer (a very poor alternative to the heat gun I don't have) that failed to make the plexiglass hot enough to bend. I nearly had given up at this point and stuck it in the oven at 500 degrees. Amazingly, after a few minutes the plexiglass became so hot the whole plate was as flexible as paper, so I took it out of the oven then bent the plexiglass quickly while it was hot with gloves and successfully maintained the unique shape after putting it back in the oven to heat up three times. The sides of the case were made out of very thin plexiglass that were easy to cut with sharp scissors. I attached the pieces by melting several points with a soldiering iron, somewhat like "plastic welding." And at last, some pictures. Click the thumbnail below to view an enlargened photo of the game console when turned on. You will notice a red glow in the bottom, which is an ultra-bright red LED just for touch-ups and basically is the power indicator. Also there is a hole in the front (if someone noticed) that allows a small screwdriver to access the vertical HOLD pot, which maintains a stable picture vertically since the picture sometimes started flipping. Below are GIF animations that closely simulates how the game works on TV. 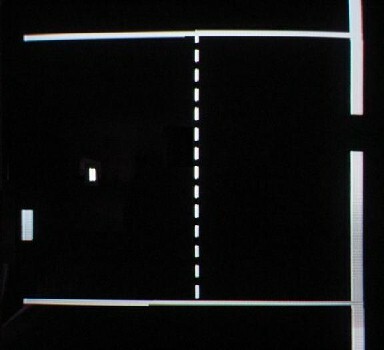 The first animation shows PONG being played by a single player with the bat on the left, and a hole on the right that is set to wobble (randomly moves up and down). The second animation shows PONG being played by two players with bats that are switched into holes to show how the ball reacts to both the bat or hole.